330ml Serve will full cream Madagascan milkshake. Using a stick blender or a food processor, blend the bananas and eggs together to form a smooth mixture. Heat a non-stick pan over a medium heat before greasing with non-stick spray. Add 2-3 tablespoons of the mixture to the pan to form a pancake. Allow the mixture to cook without trying to move it until small bubbles form on the top. Carefully turn over and cook the pancakes for another 1 minute. Cook the remaining batter in the same manner. Heat the coconut oil over a medium heat before adding the raw trail mix and cook until toasted and fragrant. Add the cinnamon and toss through. 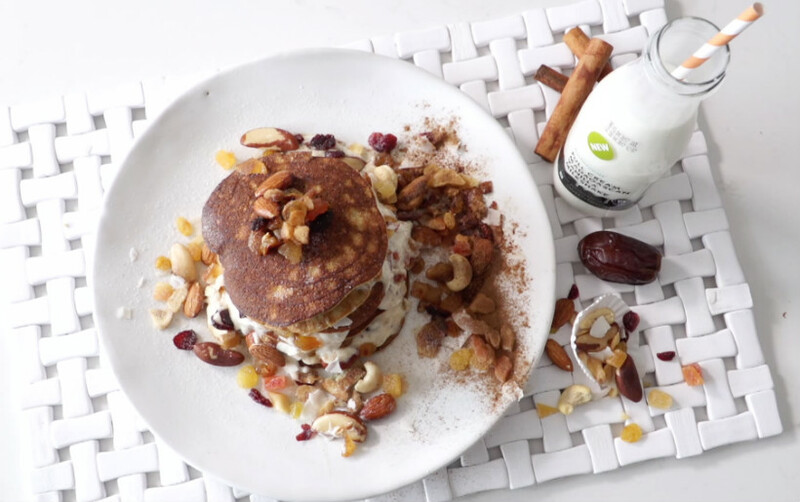 Add some of the yoghurt between the layers of pancakes and top with the cinnamon crumble.